Guys, this is sick. Absolutely sick. I know I’m saying that word a lot today, but in the context of what I’m about to share with you, it can’t be said enough. During the week of Easter, the New York Times made a series of emails public. These emails were between an abortion clinic and a fetal parts buyer. You can read all about it here, at my original article for Live Action News. And don’t skip this one…we have to face the facts and experience with our hearts what is going on all around our nation. Read below what I posted on Facebook about it, and then GO READ THE LIVE ACTION NEWS ARTICLE. We can’t hide our faces from reality anymore. It’s easier, it’s happier – absolutely – but it isn’t okay. 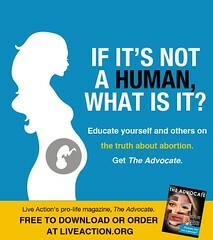 If you haven’t yet, go check out AbortionProcedures.com and spread it around to your friends. Post the videos on Facebook, please. This is a tangible thing you can do to help show America what abortion is. These things – abortion and baby body part harvesting – are happening in other countries, too, all across the globe. So no matter where you live, share this info, and help put an end to these extreme human rights violations. Alison’s Choice: Watch new movie that is saving lives! Alison’s Choice – EPK from Marchiano Ministries on Vimeo. The feature-length film centers around Alison, who is inside an abortion clinic. She’s already made her decision, but then, Jesus – in the form of a janitor – comes to talk to her. It’s amazing, it’s powerful, and it’s different than you might expect. For information on how to purchase the film (which is available on DVD) and how to request it in your own theatre, go here. You can also go to the same article to read some amazing stories of hearts changed and lives saved ALREADY by Alison’s Choice. For more on fetal development – including photos and amazing videos, go here. For more on what abortion is – from the mouths of an abortion doctor and an abortion clinic manager go here and here. NOTE: If you are unable to view the photos throughout this article, click on the links associated with each image – for example, the date, February 28, 2015 – and you will be able to see Mindy’s pictures. (Via Live Action News) – Mindy Raelynne Danison has suffered through two tragic miscarriages – one with the baby at seven weeks, and the other at eight weeks and five days. In response, Mindy created a Facebook photo album for each child, where she publicly celebrates their short, but much-loved lives. Mindy’s photos – especially one of Annabelle – have been shared on social media, and Mindy has expressed her desire for many to see her tiny babies. Their humanity could not be more obvious. Months ago, I wrote a post about the dangers of the Mirena IUD. This hormonal birth control device poses dangers to both women and unborn children. To re-cap, here’s the summary from my previous post. Summary: Why use a “birth control” method that is likely to cause death for a baby/babies you never knew about? Why use a device that hugely increases your odds of suffering an ectopic pregnancy and a miscarriage if you have it removed during pregnancy? Why choose a “contraceptive” that is manufactured by a company that even the FDA calls misleading? Why use the Mirena IUD if you are risking your own health and life in the process, along with your baby’s? To read the rest, if you missed it, go here. You will find details about how the Mirena can end the life of an unborn child and how it can damage a woman’s health and internal reproductive system. I was recently introduced to a graph that captures much of the harm that Mirena causes to some women. I’m posting it below, along with a link to a law firm that may be able to help you if you’ve been damaged by a Mirena IUD. (I’m in no way affiliated with this law firm, but they are doing a good job of bringing out the truth about Mirena.) Feel free to pass this info on! Learn more about this information here! Colorado’s New Brand: Does it really value life and equality for all? 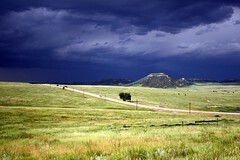 Ok, I love my state. I do. But, if you live in Colorado too, you’re probably aware of the new state brand and the campaign to market Colorado. The new brand includes a video that can be used to promote the state (watch the two minutes below for yourself). It seems that Coloradans have mixed feelings on the effort – especially considering that it cost around $1.5 million in pro-bono services, with an additional $800,000 in being taxpayer dollars. Personally, I think the video is beautiful. And while I’m not a huge fan of the logo when it stands alone, I see how marketing Colorado could be a good strategy to bring business and tourism into the state. Of course, I never support wasting taxpayer dollars. You can see how the whole issue of “branding Colorado” could be complicated. But, I have a much bigger issue with the video and the branding campaign. Simply put, I think it’s hypocritical to talk about how absolutely wonderful LIFE is in Colorado when Colorado does not protect the most innocent, helpless lives among us. Colorado is currently one of the least restrictive states when it comes to abortion. LIFE is really not so valued here in Colorado. Well, unless you’re a life that is either “wanted” (I believe every baby is wanted by someone) or can take care of yourself. How, my friends, is that something to celebrate? How can it feel like an opportunity for new lives – for unique, new human beings – when they can be freely killed here in Colorado? Opportunity does not include a killing free-for-all, which is pretty much the state of abortion here in Colorado. Wow. Yes, actually I couldn’t agree more. Even human being – every person – wants to be unmistakably excited to be alive. But how can we provide that here in Colorado when, for no reason, little reason, or any reason, we allow mothers to kill their innocent children? How can these children do what they are meant to do when they are not even allowed to remain alive? Yes. Sadly, they are also allowed to kill deliberately, with little restriction at all. 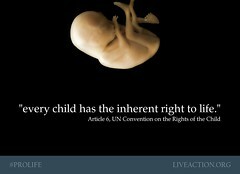 Unless you are a helpless, innocent, unborn human being. Then, you can only live the life (or die the death) your mother chooses for you. I, also, want to see Colorado move upwards. I want to see our state become a better place for ALL people to live and to thrive. But true upward momentum includes equality for all. 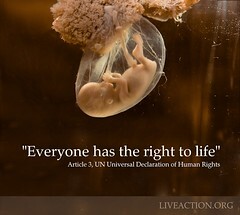 And right now, with our blatant discrimination against the helpless unborn, we are keeping ourselves in the dark ages. It’s time to reject the lies of Roe v. Wade. It’s time to reject the wrong philosophy that your life is only worth the value your mother places on it. 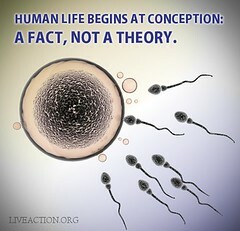 It’s time to reject the outdated theories and “science” that allow abortion. It’s time to choose the truth that every human being is a valuable person. It’s time to choose equality and equal rights for all. And it’s time to recognize the modern science that ought to inform us that every, single human being is alive and worthy of LIFE – from the very beginning. That’s what should be our nature, Colorado. If you agree, consider writing a Letter to the Editor to Colorado newspapers and letting them know how life should be fully and equally celebrated here in Colorado. Feel free to use anything written here if you like it! Death. Apathy. Women as Pawns. Lies, Inaccuracy, Misinformation. These are the things Roe and abortion have brought to us. As one college student recently told us, “I was on the fence about abortion before, but after reading The Advocate and seeing those images, I’m now pro-life”. Every edition of The Advocate bears witness to the momentum the pro-life movement is gaining in our culture, especially among our youth. I was honored to be asked to write in the Winter 2012-2013 edition of The Advocate. I was asked to write on “Forty Years of Roe, Five Years of Live Action.” So, if you’ve ever wondered just what Roe has brought us, and if you’ve ever wondered just what Live Action does, you can read my article (and the whole magazine) here. 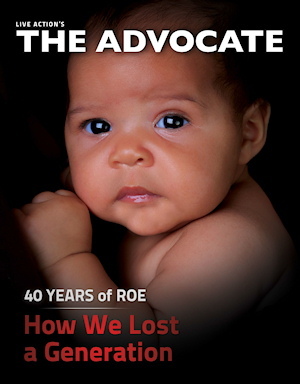 After you read, let me know what you think – what has Roe brought to America, to women, to the unborn children, to your friends and family, to you? Of course, this is great news! SFLA details some bad news as well, including the fact that Planned Parenthood is still good at marketing lies to our youth. 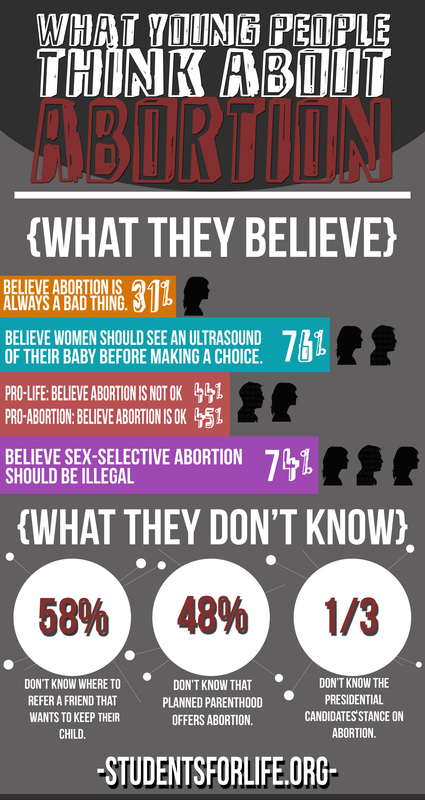 In fact, 48% weren’t even sure whether or not Planned Parenthood provides abortion. That’s scary. And a wake-up call to us to keep spreading the truth. I personally think the saddest part of the study is that 58% of young adults don’t know where to point a pregnant friend in need. We definitely need to do a better job of making pro-life resources, crisis pregnancy centers, etc. more easily accesible and well-known. We can do this by finding out the resources in our area and letting our friends – specifically any young adults – know, with the request that they tell their friends. The information will spread if we make the effort to spread it. Let me know if you have questions on how to find out the resources in your area – I’m more than happy to help! Ok, I’ve detailed more about SFLA’s study on my post at Live Action. Or, you can look at the study for yourself here. I’ve been graciously invited for an interview on Wayne Bowser’s Culture of Garbage BlogRadio show this Friday evening. Below are the details if you want to listen in. I’ll also post a recording after the show if you miss it. It starts at 7:00pm MST. The call-in number for listeners is (347) 637-3101. You can call in to speak with me or the host. Kristi Burton Brown joins us tonight! She has been called a Right-Wing Christian Fundamentalist, and a Maverick for Life in her 2008 campaign to establish the definition of a human being…to that of a person. Since losing, in a vote, the initiative in Colorado to establish “personhood”, Kristi has been relentless as an advocate for saving babies. She joins us tonight to share with us her journey that once required body guards in order for her to spread this important message of life beginning at conception! Kristi Burton Brown’s blog, titled The Lost Generation, is where she writes about millions of babies lost due to abortion, but it’s through Life Action News, where your host, Brother Wayne, found Kristi’s writing on unpopular topics like the black market trading of aborted fetuses, and of babies being tossed away like garbage. Welcome to the Culture of Garbage, where we discuss these pressing issues, and leave you with a feeling of hope by exposing the bright side of this Pro-Life message with Kristi Buron Brown! Join us for this LIVE interview as we talk about LIFE with this “young true believer”. This is crazy. Apparently, a surrogate mother is currently being pressured to abort her child by the adoptive parents. The reason? The baby has a cleft lip/palate and may also have a heart condition. Cleft lips are EASILY corrected by surgery and should not even be considered a birth “defect,” in my opinion. The major effects are clearly reversible. In addition, many people live happy and fairly easy, healthy lives with a variety of heart conditions. No parent should abort their child, but especially not for a horrible reason like this. Reportedly, the surrogate mom is pro-life, but she definitely needs our prayers. Read more here, and pray for strength for her and a choice for life.